We're Produce and wholesale high-quality products of R422d Refrigerant R & D and manufacturing, we have the perfect after-sales service and technical support. Look forward to your cooperation! Used in Europe for over a decade, R422d refrigerant is the only PROVEN R-22 replacement and is being manufactured and is available in the United States. Our R422d refrigerant is a true drop-in replacement and no system changes are required. Don`t worry about oil changes and rest assured R422d refrigerant is good for cap tubes and TXV. It operates at lower discharge pressure and temperature than R22, which is great for the compressor. R422d refrigerant is the approved R22 replacement drop- in refrigerant by Carrier Commercial. R422d refrigerant operates in R22 systems without requiring an oil change to expensive synthetic oil. R422d refrigerant has the benefit of lower energy consumption. R422d refrigerant operates at near capacity of R22. R422d refrigerant operates at lower discharge pressure & temperatures thereby reducing compressor workload. R422d refrigerant can be mixed with R22 without any system performance problems (if a service tech, inadvertently mixes the two refrigerants). R422d refrigerant has been operating in all types of systems with all types of compressors worldwide for the past 10 years. No other R22 alternative refrigerant can make this claim. R422d refrigerant is produced in Texas, the UK and China. 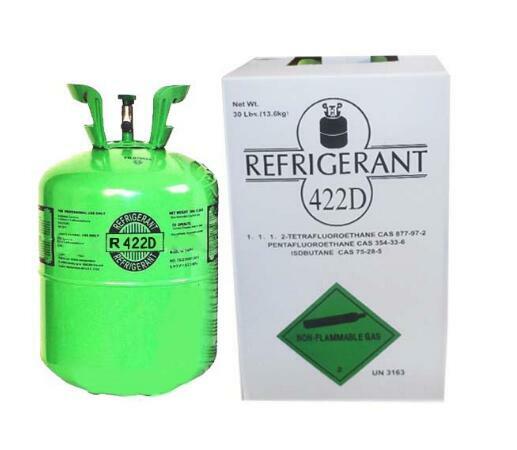 R422d refrigerant is a non flammable blend of HFC 125, HFC 134a, n-butane, isobutane and isopentane which is zero ODP. It is compatible with both traditional mineral and synthetic lubricants so that a retrofit is not required. The hydrocarbons in RS-44 improve the oil return to the compressor to extend the life of the compressor. R422d refrigerant is a direct replacement for R22, providing an easy and at the same time a long term solution. Because there is no need to use expensive and hygroscopic synthetic lubricants (POE), the risk of moisture ingress into a refrigeration system is completely avoided. R422d refrigerant has significantly lower discharge temperatures and pressures than R22 which removes the problem of oil decomposition and improves the coefficient of performance and saves wear on the compressor. R422d refrigerant is suitable for use as a replacement for R- 22 in existing residential, commercial and industrial air conditioning and refrigeration systems, and appliances. Because it is a blend, it is recommended that R422d refrigerant be charged into systems as a liquid as opposed to the gaseous phase. Since there is no need to change the existing lubricant, RS-44 is straightforward to use, as the following procedure outlines. R422d refrigerant is compatible with both mineral and alkybenzene oils found in R22 systems, and also with the polyolester lubricants. Therefore, there is no need to change the lubricant although compressor manufacturers' recommendations regarding lubricity should be followed. R422d refrigerant is compatible with all materials commonly used in refrigeration systems previously charged with R22. In general, materials which are compatible with R22 can be used with RS-44. lt is recommended to check equipment manufacturer's retrofit literature and obtain recommendations from equipment manufacturers with regard to materials' compatibility. None of the components of R422d refrigerant contains chlorine so that it has no ability to deplete the ozone layer. As with all hydrofluorocarbons (HFCs), R422d refrigerant does have a direct global warming potential (GWP), but this is counterbalanced by its lower Total Equivalent Warming Impact (TEWI). Tests have shown that R422d refrigerant has a higher Coefficient of Performance (COP) than R22 in a range of applications including commercial refrigeration systems and heat pumps, both in the heating and cooling mode. Copyright © 2019 QuZhou Bingcool Refrigerant Manufacture Co.,LTD All rights reserved.